The SinuPulse Elite Advanced is our pick for the best sinus rinsing machine, which has an LED screen display that lets you see all of the settings that are needed. It has a pressure control that is easy to adjust and it has many ingredients that you can use for it. Our step-up pick is the Grossan Hydro Pulse and it is a great solution for clearing your nasal ways without drugs. The whole thing only takes 3 minutes to use as it is very easy to use. In fact, it also includes a throat and tongue cleanser. The budget pick is the Harmony Life Adjustable and it works well to clear your nasal passageways from mucus and other pollutants like dust and mold. There is a transparent water flow due to the uniquely designed button. Environmentally friendly plastic is used for the housing. A sinus rinsing machine is a kind of machine that is used for allergy and sinusitis sufferers. This kind of machine has the objective if clearing out the blockage that is found on your nose and nasal cavities. In short, it can help you breathe properly if you have problems with breathing. 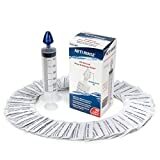 It is extremely essential for those with difficulty in their respiratory system. Sinusitis is a hard kind of condition because it stops you from focusing and breathing properly. It blocks your nose and nasal passageways that can make you feel uncomfortable. This kind of problem can arise if you often sneeze due to allergic rhinitis (see below). Your nasal bridge can ache as well as the center lower part of your forehead. It can terribly hurt when it is not treated properly. Allergic rhinitis or nasal allergy can also lead to or is connected to sinus problems. Nasal allergy is characterized by constantly sneezing involuntarily. These uncontrollable sneezes can be really bad and can damage your nasal airways if you don't control it. You may mistake it as a normal cold but it is actually an instance of allergic rhinitis that can be annoying if it repeats and cannot be cured by normal cold medicine. Nasal allergy can't be fully treated but it can be alleviated. The use of antihistamine medicines, usually in tablet form, can be taken once in the day and can be repeated on the next day or next 2 days depending on the severity. This can help stop and block the allergic reactions so that you will no longer sneeze involuntarily. This will cause you to feel drowsy/sleepy, however, so it is best taken before bed or in the late afternoon. Hay fever is a seasonal version of the rhinitis. Hay fever can come in the spring most of the time due to the fact that pollen can be around the atmosphere, especially if you live in an area with a garden or many pollen inducing plants that may induce hay fever or allergic rhinitis symptoms. This can be managed with medicines and it may come to pass later on anyway, along with the seasons. Sometimes, sneezing too hard can cause sinus problems. This kind of nasal problem can be hard to address, but an ENT may work things out for you. The job of an ENT is to be the doctor for a person's eyes, ears, nose and throat, hence the acronym. This kind of specialist can diagnose the kind of severity that you have with your nasal problems, so that you can treat it with the proper medicine or procedure, such as the use of a sinus rinsing machine. Medically approved: you have to consider a nasal problem clearing tool that is approved by medical associations or governing bodies around the world connected to medicine. It should have certifications in order to be medically correct for use for patients who have sinusitis and similar nasal blockage conditions. 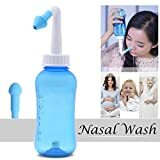 Ease of use: you also have to consider a nasal problem clearing tool that is a breeze to use and to operate, since it will be a medical item, anyway. You have to consider that patients condition so that they will find a much more comfortable item to use without a lot of hassle, especially when they use it alone in times of emergencies. Effectiveness: you also have to know and test if the nasal problem clearing tool is really effective at clearing your nose. It should work well right away and its mechanisms and nose piece should not be too intrusive or uncomfortable when you are using it. Portability: you can have a nasal problem clearing tool that is very portable, so that it will not cause problems later on when you need something for emergency purposes. Remember that breathing is a necessity, and so you should always have the nasal problem clearing tool in handy whenever you need it - in an easily accessible place like your bag or wallet. The SinuPulse Elite Advanced is our top pick, which has a fully adjustable pressure control so it is very simple to operate. You can get rid of blockage in the nasal and sinus passages due to the technologies such as the middle EZ touch button. There is also a leak resistant design so that the machine does not leak when you are trying to use it. This system is also clog free so that you won’t have trouble cleaning it. The LED screen display makes things easier with the settings. It can be used with an y sterile, distilled, filtered or boiled water. You can use it with various formulations of saline solution and the like. Being FDA registered, CE and UL approved for your safety needs, the unit is backed by a 2 year full warranty. The only con but not a deal breaker with the SinuPulse Elite Advanced is that it might take some time getting used to in learning how to use. The Grossan Hydro Pulse is our step-up pick, which only 3 minutes to use so it is very simple and straightforward and can be used when you are on a rush when it comes down to your daily activities. The nasal passageway cilia work better with this kind of mechanism and without the need for nasal drugs. It will make you feel great right away due to the instantaneous result as the machine does the work. There is also a throat and tongue cleanser so you get a 3 in 1 product all in all. The package comes with complete instructions so you don’t have to fuss over this kind of mechanism unit. You can get your allergies and other nasal problems cured or alleviated with this unit and also get rid of pollen, and foreign matter. Don’t worry, as the unit is designed to be super-gentle for your nose. The Harmony Life Adjustable is our budget pick, which is made from environmentally-friendly plastic so it is very durable and also eco-friendly at the same time, being safe to use for breathing. A perfect water flow can be achieved due to the uniquely designed button for the whole unit that makes it transparent to see the solution that you are currently using. Many mucus and other pollutants can be rid of with this kind of unit. There are also user instructions on how to use your nasal cleaner so you don’t have to worry about the learning curve. There are 2 sizes for this unit: 300ml and 500ml, so that you can choose accordingly. To adjust the flow, you can easily squeeze the bottle. In addition, the mechanism of the whole unit makes the flow optimum and efficient due to the use on the pressure release valve that is included on the bottom side. For adults, the Xcellent Global 300 ml is a great choice because it can clear out the internal physiological structure of your nose from blockage as a nasal wash pot that can be used on the go for you to clean the nasal cavity. It can be used both for adults and children due to the flexibility of the design. It can help you get rid of dirt, pollen, mucus, dust, mold and other things that are stuck. It is great for daily nasal care and it also has the capability to alleviate those with symptoms of hay fever, nasal allergies, flu, cold and sinusitis. There are 2 nose tips for kids and adults so that you can choose accordingly. The capacity of the unit is at 300 ml so you can use it for longer periods of time. The control of the flow speed can be done by the bottom button to make it easy to use. The ttstar Portable Compressor is an ideal choice for kids and adults as well as it comes with all the needed pieces, such as the air tube, filter and mouth piece. The noise levels are less than 60 dB so it gives you a less destructive and quiet operation. One important thing with this kind of unit is that you can store your accessories to it whenever possible due to the fact that it comes with a storage container. You can use it for treatment of respiratory ailments and nasal conditions. It has an average conversion rate of ≧0.2 ml/min and it a capacity of 5 ml for each medication. The liter flow range Is 6 to 8 LPM and its compressor pressure range is from 30 to 36 psi. Particles that are used in the mechanism rate from 0.5 to 10 um. It is given a 1 year warranty. 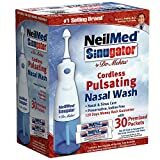 The NeilMed Sinugator Cordless is a portable and cordless nasal wash solution that comes with all of the things you need, such as 30 premixed packets. It is ideal for nasal care and is free from preservatives, gluten, latex, BPA, iodine and other harsh drugs. It can be a great step that can be done before spraying nasal corticosteroids for most nasal problems. USP grade sodium chloride and sodium bicarbonate are included in the packets. There will be no operational problems with this kind of unit as the batteries can last longer than the actual unit. The part of the unit that is the singulator also works well and it will be useful for those with terrible allergies or those who need to clean out their airways and very horrible head colds. Most people prefer 1 packet per nostril to use with this unit for better results. Those with allergies and allergic rhinitis can greatly benefit from the Acu-Life Neti Rinse , which can produce a gentle swirl due to the internal walls being fluted in design. The tip is also antibacterial so it won’t easily clog your nose and may even disinfect it. You can handle the pressure and duration of rinse due to the syringe delivery system that works inevitably well. There is less likelihood of backflow even when you are using it to rinse. This clearing mechanism can make use of large volumes of rinses that use low pressure so it is clearly not harmful for your nose. The tips or the top can be easily cleaned with rubbing alcohol when you need. In addition to that, you can use the saline packets without making too much of a mess. It is a great tool to use during the allergy season and offers a great nasal passageway flush out. The Vicks Inhaler V1200 can be ideal for those who want steam to clear out their nasal passageway. It can help alleviate most symptoms of respiratory ailments such as bronchitis, flu, colds and others. It gives a good vapor therapy and can clear most throat passages naturally. The included plastic hood is durable enough but not too harsh for you to use when your nose is blocked. There is a soothing steam that gets into your nose to clear it. You can easily get a 5- to 15-minute treatment with this easy to use mechanism that require minimal operation due to the simple button and lightweight design. Most dryness and irritation for the nasal areas can be avoided due to the natural and conforming design of the hood. There is also an on/off indicator light to let you know whether the steam is flowing or not. You also have the option to use scent pads for this mechanism. For those who want an aromatherapy diffuser, the Hann Facial Steamer is a good choice because it can hold a large amount of water mist in the mechanism and it can also freely run as internal humidifier. It may also help you to regulate mood when you feel sick due to the nasal problems and it uses a clear and safe natural oil vapor. The fog-emitting plate conforms to your skin so it does not make your nose uncomfortable. It also works well to remove dead skin cells so you feel better with your skin and your nose. Aside from clearing your nose, it can also work well to recover elasticity for your skin. The unique nano-ionic steam helps you achieve this, as it has a powerful but soothing vapor for both your face and your nasal passageways. 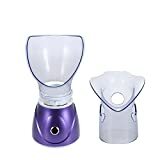 It comes with a measuring cup, facial steamer, nose inhaler and a user’s manual, and is rated for 110-240 volt systems. For those who want a free nozzle or extra nozzle, the Tonelife 500ML Nettie is a good choice for you. It can get rid of most pollutants for your nose, such as mucus, dust, pollen and mold. It has a good water flow that can be seen through the clear bottle that is quite transparent to monitor the water levels. The nozzle included are for adults and for children. 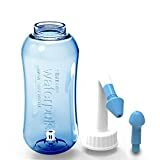 The bottle has a capacity of 500 ml for nasal solutions. The button helps you to control the flow of the water underneath, in which you can use distilled water or previously boiled water that is lukewarm. It is also BPA-free so it is safe for children and adults. You can also get rid of the air bubble due to the design of the whole system. It may be a little more expensive than other systems, but it will definitely work for nasal problems. There were others that did not make it to our list because they were ineffective in clearing out the nasal problems of a person. They were also not medically recommended so they can be a bit questionable with quality and safety overall. Q: What are the symptoms of nasal passageway problem? Also called postnasal drip, this is when your nose discharges fluids all the time. This is one of the most annoying symptoms of nasal passageway problems, and is also similar with allergic rhinitis. Nasal congestion is described as clogged nose, in which you may have difficulty in breathing and you may have nightmares or trouble in sleeping at night due to the blockage of your nose. You may also feel a slight tenderness with your nose bridge, where the nasal passageway is located. This is because of the inflammation of the part. Nasal passageway headaches are also considered a symptom of nasal passageway problem as well as the symptom of most allergic rhinitis and nasal allergy problems. In most cases, those with nasal passageway problem may also have pain in their mouth, gums or teeth. This sets apart nasal passageway problem with allergic rhinitis. People who may have nasal passageway problem feel dizzy and full of fatigue due to being tired of all of the headache and blockage in their nasal cavity. Most people with nasal passageway problems may also experience fever, which also sets it apart from the regular allergic rhinitis. Compared to nasal allergies, bad breath can also attack when it comes down to nasal passageway problems. People with nasal passageway problem may also experience moderate to severe coughing. Because your nasal passageway connects your ears, nose and throat, you may also potentially get ear ache as a result or a symptom. Sore throat is associated with bad breath, and this can come if you have nasal passageway problem. In some cases, sore throat may also occur if you also have allergic rhinitis or hay fever, or the feeling of dryness in your mouth. Because your nose is not able to function properly, you will also find that your foods do not taste very well, just like when you have a cold. Q: What are the causes of nasal passageway problems? Many people who have allergic rhinitis are also bound to have nasal passageway problems later on. This is because constantly having to blow your nose due to the runny nose can be troublesome and thus, stressful to your nasal passageways. Your respiratory system may also be infected and this can cause the nasal passageway problems that may also be related to a nasal allergy or some other infection or problem. This can block the nasal passageway and this can cause your nasal passageway problems and make them worse later on. They can also block your nasal passageway and that may also cause the nasal passageway problems to grow worse. HIV is a good example of such diseases. Basically, if you have a weak immune system, you will also most likely have nasal passageway problems. Reflux and cystic fibrosis can also affect your system and it will also impact your nasal passageway problems. People who have asthma may also have complications when it comes down to their nasal passageway problems. Another possible cause for nasal passageway problems is when there is too much smoke in your area, such as due to cigarette smoking, area pollution and even cooking. Many people may also have nasal passageway problems due to aspirin sensitivity. Q: What are some treatment for nasal passageway problem? 1. 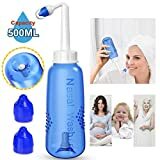 Saline sprays and washes – these can come in handy if you want to treat your nasal passageway problems right away, and the pain does not stop with medication. 2. Bromelain supplements – you can take these supplements so that your nasal passageway problems can be gone or at least alleviated. 3. Steam inhalers – these can work well, much like the saline sprays, so that you can relieve your nasal passageway problems, as hot steam can help with blockage. 4. Keep yourself hydrated – drinking just the right amount of water per day can really help to unclog your nose and your nasal passageway problems. 5. Take spicy foods – because of the hot capsaicin from spicy foods, your tongue delivers this heat to intensify your nasal passageway and thereby unclogging any blockage. 6. Treat your home – sometimes, you may also need to allergy-proof your home to alleviate nasal passageway problems by changing your bedding, cleaning more often, managing pets, etc. 7. 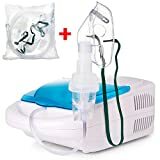 Go for a humidifier – in most cases, nasal passageway problems can also be alleviated with the use of a humidifier so that you can breathe more properly. 8. Use a warm compress – a warm compress can help alleviate the pain in your nasal passageway because of its soothing feeling. 9. Use antibiotics responsibly – while antibiotics are okay, you will develop antibiotic resistance if you take them too much, and will eventually not work anymore to help cure your nasal passageway problems. 10. See a doctor if the pain doesn’t stop – if you believe that you have done everything in your power and the nasal passageway problems do not end, consult an ENT (see below FAQs). Q: How can you treat nasal passageway problems? Cigarette smoke can definitely trigger nasal passageway problems so you should stay away from them. If you don’t treat your cold and allergies right away, they can result in more nasal passageway problems due to the pressure on your nose. This is common sense, but people need to be reminded that most respiratory diseases can be contagious, so it is best to stay away from them or isolate yourself. If you have allergic rhinitis and this caused your nasal passageway problems, consider avoiding allergens like pet dander, dust, plant pollen and mold. Dry air is a good trigger for nasal passageway problems so you should avoid dry air as much as possible by using a humidifier to keep the air humid (but not too much in a way that will suffocate you and cause mold spores to appear). Most health centers in your locality can offer immunization programs for free to help with the prevention of nasal passageway problems in the future. Q: What are the signs and symptoms of allergic rhinitis? This is the number one symptom of allergic rhinitis, and it can’t be stopped unless they take medicine. This is also a common symptom, and goes hand in hand with constant sneezing. Too much nose blowing may also lead to nasal passageway problem. This goes hand in hand with the runny nose because your nasal passageways are affected. Along with itchy and watery eyes, you’ll notice your eyes can get swollen as well. Most often, allergic rhinitis can also dry your throat and cause it to sore. Along with your runny nose, your nose will also get itchy from time to time. You will feel more tired if you have allergic rhinitis throughout the day. This is because of the constant sneezing and the runny nose effect. Along with other symptoms, you’ll also feel some headaches from time to time. Along with sore throat, allergic rhinitis may also give dry cough. This goes hand in hand with watery eyes. Because allergic rhinitis is connected to your hearing due to the nose, it will have an effect on your hearing. This is similar to having a cold. This is also similar to having a cold. Q: What are some causes of the allergic rhinitis? These causes of allergic rhinitis are the most common allergens and can be all around you, especially in your home if you don’t clean properly. This includes cigarette smoke and wood smoke. When the temperature changes suddenly, you’ll most likely experience allergic rhinitis. This is for when you work in factories with fumes and harsh chemicals. The humidity of the wind can also trigger allergic rhinitis due to dust mites and dryness. Along with chemicals and fumes, artificial chemicals on your perfumes may also trigger allergic rhinitis. Q: What are some treatments you can consider with allergic rhinitis? This usually comes in tablet form, but some are also in syrup form for kids. These are sprays that are recommended and prescribed by allergists. They can also be injected into your body as well. These are made for the symptoms of runny nose and blocked or clogged nose. Nasal sprays can come in various forms, such as rinse bottles, neti pots and saline rinses. Immunotherapy makes the use of shots to avoid getting allergic symptoms, especially for those with extremely severe symptoms that can disrupt your daily activities. Q: How can you prevent allergic rhinitis? 1. Clean your home from dust mites. 2. Use HEPA filters for cleaners and A/C units. 3. Choose your bedding and upholstery properly. 4. Limit pets in the house or bathe / groom them often. 5. Monitor pollen counts in your locality. 6. Don’t go into grassy areas. 7. Attend to your lawn more often, if you have one. 8. Clean your home from mold. Q: How is allergic rhinitis different from the common cold? Common colds often give you body aches, most of the time. Allergic rhinitis often give aches to your eyes and throat. Common colds are associated with fever. Nasal allergies are not associated with fever. Common colds are not associated with itchiness. Allergic rhinitis can cause your nose to feel itchy. Common colds only have quick symptoms. Allergic rhinitis can occur for longer periods of time. Common colds can be treated with decongestants. Allergic rhinitis can be alleviated with the use of antihistamines. Q: What are some common misconceptions with nasal passageway problem? Actually, antibiotics, when used too much, will result into antibiotic resistance. Not so, because nasal passageway headaches are mostly caused by allergies. Flu does not cause nasal passageway headaches because it is caused by the influenza virus, which is associated with the common cold. Not all the time, since surgery is only a last resort, and you should go through CT scan first and recommendation from a physician. Stuffy nose can be alleviated with decongestants, but only for a short period of time. Nasal sprays work better for this kind of problem for your nose. Q: What are some misconceptions with allergies? Actually, all kinds of pets can cause allergies because pet dander does not come from the fur, but from the skin flakes and the pet saliva. It depends on the severity of your allergies. Sometimes, it will be regular reactions but some will be worse or less. Not always true, as some children, when they grow up, can still have their allergies if they get exposed to the allergens again. Of course not! Allergies are uncontrollable, just like a sneeze. All types of allergies cannot be prevented by emotions, although stress can also sometimes worsen them. However, if you do physical activities and keep yourself busy, you’ll most likely release endorphins to hold back allergic symptoms, but they’ll come back sooner or later, so you still need medicine. Actually, it is the dust mites, not the actual dust, that causes allergic rhinitis. Actually, dry air can worsen allergic rhinitis, and there are still some weeds that can survive in dry and tropical climates. Not so, as repeated exposure may actually worsen your pet dander allergies. Not always, as there are really severe cases where allergies do not stop even if you take one or two tablets of antihistamine, and that’s okay! It may be due to the season and other factors, but it is definitely safe to take them continuously – just not on overdose. Q: What aspects of a person’s life can be ruined by allergic rhinitis? Q: What are some common allergens that you should avoid if you often get triggered by allergic rhinitis? 1. Spores and pollen – these can come from plants and grasses. They are most commonly found in spring and sometimes in fall. In most cases, they can also be found in the summer. For 2-season or 3-season countries without snow, you may experience it more often during the change of weather from rainy to sunny and vice versa, or when you have many pollen-bearing plants around. 2. Dust mites – these are everywhere, and they cannot be escaped unless you clean your surroundings. These small insects can lurk in your bedding, in your clothing, and other places (and they look terrifying under a microscope, trust us). Dust mites are the main cause of allergies, not the actual dust. They can be cleared out of the way if you change your bedding often. Kids who keep stuffed bears should have them washed often. 3. Pets and animals – you should be responsible with pets if you have someone in the house who has allergic rhinitis. Dogs and cats are the most common sources of pet dander that can potentially trigger nasal allergy and sneezing, so you should limit their movement around the house or bathe them often. Grooming them more often eliminates the likelihood of shedding in the house. 4. Industrial allergens – if you work in a factory, you should definitely wear a mask to avoid getting exposed to industrial pollution that might trigger your allergies to occur, so that you can keep on working for hours without feeling distracted by allergic rhinitis. Examples of industrial allergens include smoke and toxic fumes, which can enter your nose and cause allergic reactions. Q: What are some of the most common antihistamines I can buy on a pharmacy? Q: What exactly are the causes of nasal passageway headaches? Q: What are the duties and responsibilities of an ENT? Q: Can animals cause rhinitis? A: Yes, pet dander is a common cause or allergen of people who have allergic rhinitis. People who have dogs and cats around the house will often have the symptoms of constant sneezing, so pet allergies should be controlled by having pets limited in the house, especially if the allergic symptoms gets worse around them. Q: Can cosmetics cause allergic rhinitis? A: It depends on the kind of makeup that you have. There are many brands that are safe for sensitive skin and will not trigger allergic rhinitis as well. However, mascaras should be taken into consideration, as pollen and dust mites might stick to it if you are not careful. Q: What are the two types of allergic rhinitis or hay fever? 1. Intermittent – this one affects people seasonally, or during pollen season. It is usually in the season of spring or summer months when the pollen count is pretty high, as well as in the autumn. If you live in an area with a lot of opportunities for mold growth, then that can also trigger intermittent or seasonal allergic rhinitis, such as in rainy seasons. 2. Persistent – this one can hit you in any time of the year, regardless of the season. In fact, most people who have allergic rhinitis have both persistent and intermittent types, but the condition just worsens when the pollen count and the mold spores are getting high in your area. If your symptoms persists and disrupt your lifestyle, then it might be ideal to see a doctor or get medication. Q: What are the ways to help stop a runny nose? 1. Get some sleep and avoid staying up late as much as possible. 2. Stay hydrated more often to help clear your nose. 3. Try a steam bath or steam inhaler. 4. Go for a humidifier. 5. Use a warm compress to help with nasal passageway problems. 6. Consider nasal drops or a nasal spray. 7. Determine whether you need decongestants for colds or antihistamines for allergies. As a whole, we conclude that the SinuPulse Elite Advanced is our pick for the best sinus rinsing machine due to the ease of use on the LED screen display for viewing the settings and the many ingredients that can be used for the system. There is also a pressure control system for ease of flow adjustments.